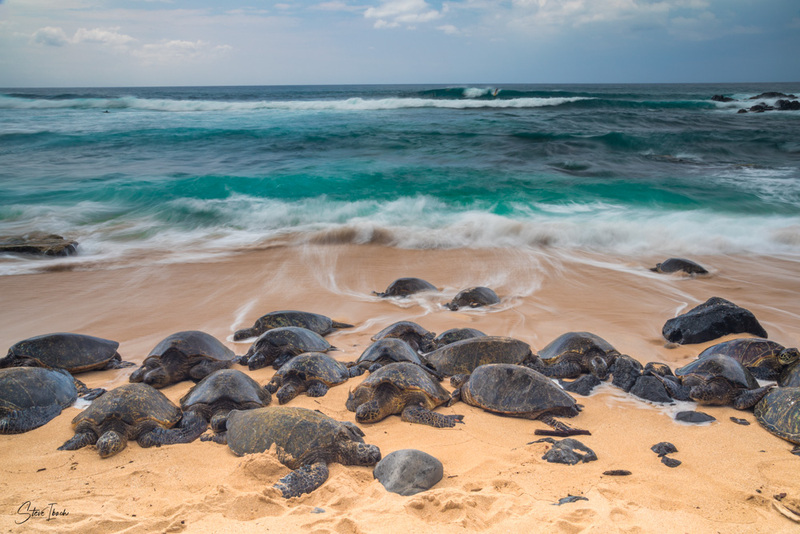 This stunning piece shows over a dozen endangered green sea turtles (called “honu” in Hawaiian) moving in and out of the ocean while the waves wash across the beach. A surfer rides the waves in the background to complete this breathing Hawaiian scene. This shot was taken on the world famous surfing beach of Ho’okipa on the island of Maui using multiple techniques to slow down the image to provide the motion effect in the water and amongst the honu. Honu are typically over 200 pounds each and can be seen on Hawaiian beaches resting in the sun. They are protected under the endangered species act and Hawaii state law. No honu were disturbed during this photo session. Our Hawaii fine art is produced with original gallery quality photography shot by Steve Ibach, a now retired founder of Hawaiian Experience Spa and a professional fine art photographer on Maui. Steve’s current passion is to make gallery quality fine art photography affordable, especially to guests of Hawaiian Experience Spa. Our metal art prints represent a new art medium for preserving photos by infusing dyes directly into specially coated aluminum sheets. The images take on a magical luminescence and produce brilliant and impressive prints that can last a lifetime! Colors are vibrant, and the luminescence is breathtaking. All metal art prints have a high gloss finish for unsurpassed detail and vibrancy. Metal art prints come with a professional float type mounting brackets that allow your art to hang ½” from the wall when mounted. Metal art prints do not need any type of frame and are ready to hang upon arrival. Click the order button below to see available sizes and prices. All prices are less than 50% of those found in the galleries of Lahaina and Honolulu. Kama’aina also receive an additional 15% discount.